Spring has a remarkable way of showing us that the time has come to shed our winter layers and prepare for a re-birth. Just like new growth emerging from the soil ready to reveal its vibrant beauty, now is equally the perfect time for us to transition and bring our dull winter skin to life; to awaken, renew and blossom. I am highlighting my top 3 Rhonda Allison ingredients and treatments in use at Sound Skincare this season of rebirth. Although these products are solely for professional use, I believe in sharing my knowledge about why I choose to use specific products and ingredients, so that you can understand their role as you lay blissed out before me. 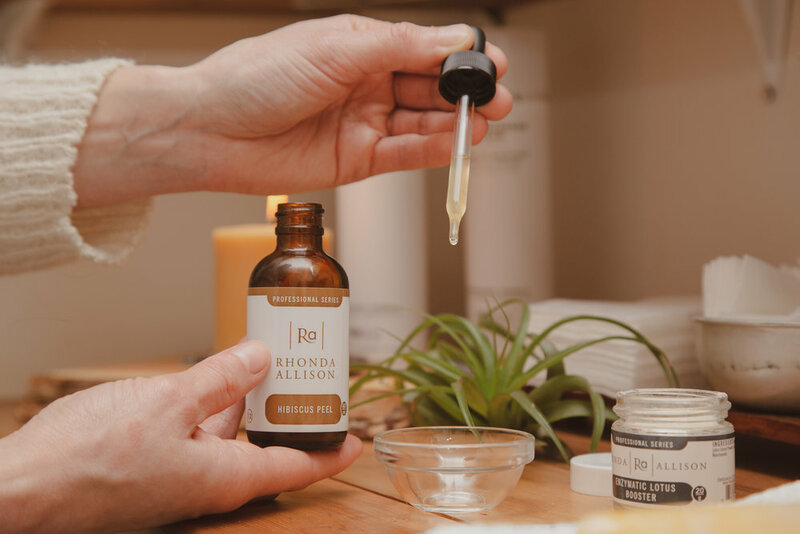 One of my favourite go-to’s for facials is the Hibiscus Peel from Rhonda Allison. Hibiscus acids are considered a second generation alpha-hydroxy acid, which increase cellular turnover, provide antioxidant benefits, and stimulate collagen production. Our skin greatly tolerates these (and other flower acids) because they are less irritating and much more moisturizing (twice as much, in fact) than most traditional AHA’s. It provides skin lightening, healing and moisturizing benefits, making it a great rejuvenator for all skin types. When it comes to this mask’s ingredients, the power is in the numbers! This is the perfect complex of 12 unique flower acids all with their own benefits of brightening, hydrating, calming, as well as providing nutrients, flavonoids and antioxidants. These 12 flower extracts include: rosehip oil, cactus flower, hibiscus, blue lotus, white frangipani, magnolia, rose oil, passionflower, honeysuckle. kangaroo paw flower, banksia flower, red spider flower. These last 3 extracts are native to Australia, and help to impart feelings of kindness, relaxation, strength, and enthusiasm, which I find completes this blend beautifully. Aging, dehydrated or sun-damaged skin? I am loving the benefits of this newly added booster to my arsenal, for brightening, smoothing and softening the skin. With powerful ingredients of papain, lotus extract, and L-Ascorbic, this powdered formula is simply added to masks and enzymes to further strengthen and repair. Lotus flower extract has amazing brightening and strengthening benefits due to its ability to scavenge free radicals, papain is a naturally occurring enzyme found in papaya to help digest dead skin cells while L-ascorbic acid is a valuable antioxidant and component of vitamin C that protects the skin against UV damage. Have different concerns? Don’t worry, I have a booster for that. Ask me about the different ones during your next visit! All of these products are featured throughout the Spring Blossom Facial Series, which are available March-May. Book your Spring facial today!